If you want to know how to buy health insurance then you are probably planning to buy one for yourself or your family. Let me begin by saying that buying a family or individual health insurance plan is not easy. Options and technicalities involved can be overwhelming. A poor plan will leave gaps in health care which is not a good situation to be in. In case of a medical disaster a bad health insurance plan will not protect one’s finances. Medical bills are the leading cause behind majority of bankruptcy filings. CNN reported (as per a Harvard Study) that in 2007 62 percent of US bankruptcies were because of medical bills. Disturbingly 78% of those fliers had health insurance. Obviously a lot of people buying health insurance are buying the wrong plan. Why Are Wrong Plans Purchased? Buying health insurance is not easy. There are many health insurance companies offering a number of health insurance plans. Monthly premium, benefits, reach of the network, and out of pocket cost varies from plan to plan. Health insurance comes in different flavours like HMO, PPO, and HSA. Balancing the cost of insurance with its benefits can be a daunting task. Wrong choice can result in inferior health care and financial distress. Many buyers may be making their purchase decision on cost alone. Many a times health insurance is purchased online or over phone without going into the fine print. But buying health insurance need not be rocket science. One should plan well and keeps an eye on common health insurance trip wires. This “how to buy health insurance guide” will make you a more informed shopper and also help you avoid common health insurance pitfalls. Buying an individual or family health insurance plan starts with proper planning. Health insurance is the most important investment you make for health and financial protection. It should be taken with the same seriousness as retirement planning, 401k investments, or buying a house. Engaging an insurance advisor is the first step you need to take. Many buyers do not go beyond comparing health insurance quotes online. This may not be the best strategy. Health insurance quotes websites are simplistic. They ask for minimal information before offering quotes. For example to get health insurance quotes from ehealthinsurance.com one only needs to give age and zip code. You may apply to the wrong policy and get rejected leading to nightmarish consequences. Insurance advisor is your best friend when it comes to buying health cover for self or family. Insurance advisor guides through the application process and helps choose a cover which best suits your needs. As your first step sit down with your insurance advisor with a cup of coffee and chalk out your plan. Caution: Don’t leave everything on your advisor. Read on to know more. This is a very important step. Note down your present and future needs. Different folks buy health insurance for different reasons. A friend of mine recently purchased individual health insurance because he left his job at a large corporation to become an entrepreneur. Needs of someone graduating from college will be totally different from 45 year old freelancer with wife and kids. Keep the following things in mind when evaluating your present needs. Present health of people needing insurance. Are there any pre existing or past medical conditions? If members needing insurance are young and healthy then HSA eligible plans should be part of consideration set. Evaluate current financial condition. How much can one afford to pay from one’s pocket in case of a medical emergency. 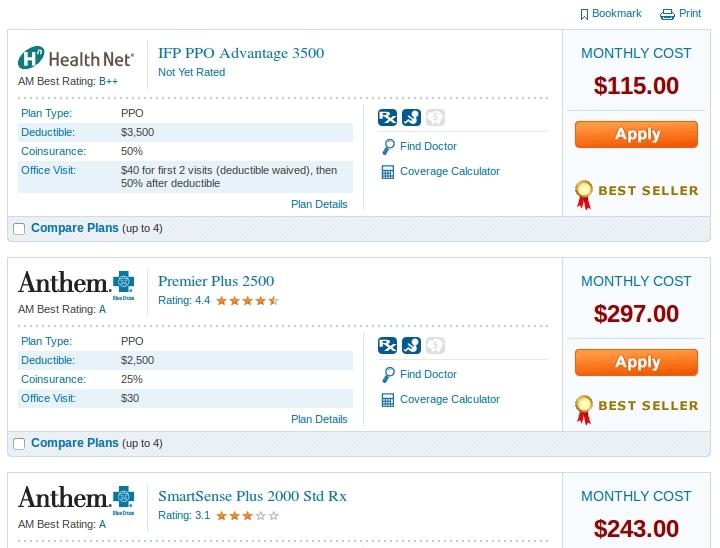 This will help one decide if one should go with a high deductible or a low deductible plan. Does one has preference for specific health care providers? If the buyer is receiving care from specific providers and wants to continue she should first check if the provider is part of the new network. Any medication one is currently taking and if the new plan will cover those medicines. Mark where you currently live on Google Maps. Next plot the nearest health care providers in your new plan. This will give you an idea how convenient your new plan will be. Circumstances of the insured keeps changing. The insured may get married, start a family, develop a medical condition or relocate. Wise health insurance buyers factor these future variables in their buying decisions. For example lets say Joe is planning to buy health insurance. He knows that he is at a high risk for diabetes. He should choose a plan which has good coverage for diabetes related health care. This plan should offer excellent eye care, blood sugar tests, testing kidney function etc. Make a list of things that can change in the future. Your Insurance advisor should be able to help you with this. To get the most out of your Insurance advisor one should know the language of health insurance. Health insurance can throw a lot of terms at you. At the very least you should understand HMO, PPO, HSA, Copayment, Coinsurance, Deductible, Network, PCP, and Maximum Yearly Out of Pocket. This blog has a compendium of health insurance terms. This blog also has detailed articles on many health insurance terms. Create a list of health insurance companies in your area. For california this list will include companies which offer individual health insurance like Anthem Blue Cross, Kaiser Permanente, Blue Shield of California, and Health Net. Next step is to use an online health insurance quotes service like ehealthinsurance.com or health.usnews.com to generate quotes. This will give you a list of health insurance plan in your area. How to buy health insurance? Getting an online health insurance quote from ehealthinsurance.com will give you a list of plans in your area. This list of plans gives you a good starting point. But do not stop here. Visit company websites and use their online quote generators to get the plans from the horses mouth. Also involve your insurance broker in this process. She can recommend companies and plan you may have overlooked or do not know about. Health carrier review new applicant’s medical history. Based on past and current medical conditions an applicant can be denied coverage. As per Obamacare, health insurance companies will not be allowed to deny coverage based on past and present medical conditions. If you are buying individual health insurance before 1 Jan 2014 you should know how health insurance companies review applicant’s medical history. There are two ways health carriers react if the buyer has an adverse medical record. Some carriers will reject the application and deny insurance. Others will charge a much higher than advertised premium. Sit with your insurance advisor to chalk out a strategy. Health insurance companies are not created equal. Some health insurance companies are generally better than others. In certain cases a health insurance company which is not the best overall can be good choice for a specific cover. A smart health insurance buyer surveys health insurance companies in her consideration set before zeroing in on one. You should buy from a carrier which has a great customer care track record. Ask your friends and family to share their experiences. Ask your friends on facebook. Check what customers are saying about their carriers on facebook and twitter. Your state’s health insurance department’s website also maintains customer complaints. Don’t forget to check that out. Many state health insurance department conduct an annual rating of health insurance providers. This gives you an amazing insight on what the customers think about the quality of care and customer service. The ratings also include a score from a panel of experts. The experts go through the medical records of patients and analyze the quality of care. They then rate the companies against national average. Some companies fare better than others for certain types of medical care. For example as per California PPO rating 2013 Health Net PPO offers best heart care while United Healthcare has the best diabetes care. You can check our compilation of health insurance ratings. Comparing plans is difficult because there are many variables including. There is no single plan which will suit you perfectly. You may like certain aspects of one plan and some from other. Sit with you health insurance agent and go through the pros and cons. Great investors like Warren Buffett are masters of evaluating choices. Their strategy is simple. Take a piece of paper and draw a line through the middle. Now start noting down pros on one side and cons on another. Carry this paper with you at all times and keep noting points as they strike you. In a few days you will have a list of pros and cons. This method greatly aids decision making. The final step is when you fill up the necessary paperwork and apply for insurance. Make sure you and your advisor have a strategy ready for this. There are two strategies to choose from. The first strategy is to apply for the plan you like the most. The pitfall is that if your application is rejected you will find it difficult to get approval from other companies. Most health insurance companies ask you to mention rejections when applying. The second strategy is to apply for more than one plan and hoping that your application will be accepted for at least one. This is a good strategy for high rejection risk applications. But it also involves more paperwork. I hope you found this article informative. If you have any specific questions on how to buy health insurance ask them in the comments below and I will be more than happy ot help.